Slice each pepper in half lengthwise, remove the seeds, and rinse out. Spread cream cheese in each jalapeño half. Cut the meatballs in half. Place each meatball half, cut side down, over cream cheese. 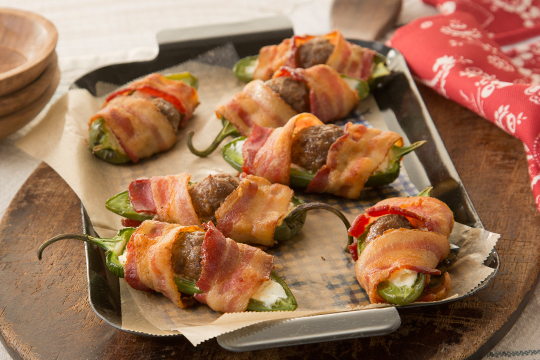 Wrap a half slice of bacon around each stuffed jalapeño and secure with a toothpick. Place on a baking sheet and bake 25–30 minutes, or until bacon is browned. Serve immediately on a platter. Important note: Use plastic gloves when cutting and preparing peppers to prevent skin irritation.